Working with large decals can be challenging unless you adopt a step by step approach to their application. If you follow the approach illustrated below you are unlikely to have any problems. 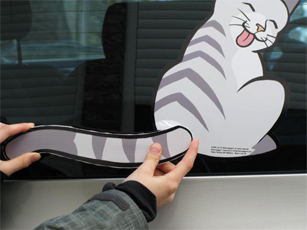 Large car decal for Cat's Body ('Body Piece'). The Body Piece includes a 'bottom slot' at the base of the cat's body which fits around the rear wiper blade pivot. The bottom slot allows the Body Piece to connect visually with the Wagging Tail when fitted. 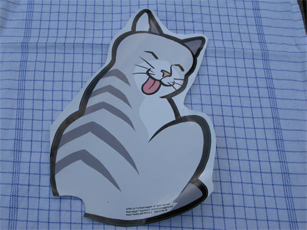 A plastic sheet with curved Wagging Tail image. A smaller decal with a narrow Wagging Tail (to fit to the spine of the wiper blade) and four pre-printed Thought Bubbles (and two mini bubbles). All components have pre-cut edges. Ensure the rear windscreen and surrounding bodywork and the wiper arm itself are oil free, clean and completely dry (note: the rear wiper arm usually has a hinge allowing it to be lifted from the rear windscreen when cleaning the glass). Although the decal image has pre-cut edges we recommend that you remove as much of the unused material as possible as this helps when doing the fitting. Roughly cut out the image leaving a small amount of surplus decal material on the outside of the pre-cut edges. Cut out the area for the bottom slot more accurately. Hold the Body Piece in position with the bottom slot positioned either side of the wiper pivot point to see how it should be positioned on the rear windscreen (note: you may need to trim the bottom slot with a pair of scissors to make a better fit round the wiper pivot point). Peel and fold back a corner of decal protective backing paper at the edges of the bottom slot and stick them down in position either side of the wiper pivot point. If you fold back the protective backing paper inch by inch it helps control the sticking down process and also doesn't get in the way. Always work away from the corner of the decal which has been stuck down next to the wiper pivot. Peel back an inch at a time of the protective backing paper keeping the exposed sticky surface of the decal clear of the vehicle. Using a thumb or fingers rub the area of the decal being stuck down, moving across the width of the decal to ensure that air bubbles and creases don't develop as you move away from the wiper pivot (note: if you feel an air bubble or crease develop you can just lift off that bit of the decal you have just stuck down and re-do that area, rubbing firmly across the decal with thumb or fingers to ensure that it doesn't happen again. 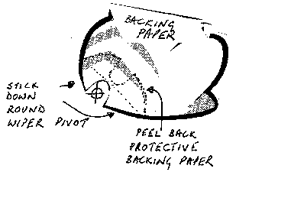 Gradually move up the Body Piece peeling back the protective backing paper as you go. 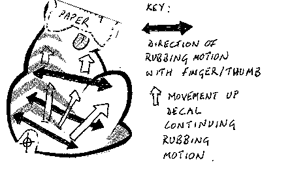 With your thumb or finger vigorously rub horizontally across the Body Piece slowly moving upwards towards the top of the head. Once again the movement of your thumb/fingers across the area of the neck and head being stuck down removes air bubbles and creases as you stick it down until the whole of the image is stuck to the rear windscreen. Next, you'll work on the Wagging Tail. You have a choice, to EITHER fit the straight tail directly onto the back of the wiper arm OR fit the curved tail on the plastic sheet using cable ties. Firstly hold the straight tail in position along the wiper arm to see how it will fit (note: you may need to trim the straight tail with a pair of scissors to make it fit your vehicles wiper arm). Starting at the wiper pivot point end, peel back the protective backing paper an inch at a time keeping the exposed sticky surface of the decal clear of the wiper arm. 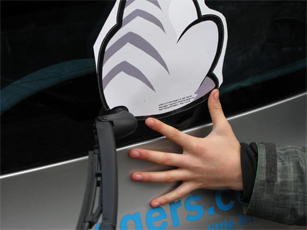 With thumb or finger rub the area of the decal as it is stuck down on the wiper arm moving steadily away from the wiper pivot towards the end of the cat's tail ensuring that air bubbles and creases don't develop. The curved Wagging Tail is already stuck to the plastic sheet. Hold it against the wiper arm with the base of the tail positioned over the wiper pivot point. Cable ties are used to secure the curved Wagging Tail to the wiper arm. Whilst holding the curved Wagging Tail in position inspect the wiper arm to identify points where the Wagging Tail may be attached with cable ties. Two fixing points are required a reasonable distance apart to properly secure the Wagging Tail to the wiper arm. Make sure that the positions you select do not interfere with any of the mechanisms on the wiper as this may impede the operation of the wiper blade. 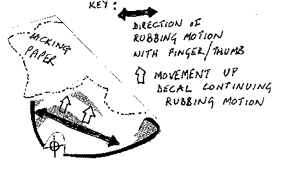 Mark two attachment positions on the curved Wagging Tail. To fix the Wagging Tail to the wiper arm, cable ties are slotted through the Wagging Tail at the previously marked attachment positions then looped around or through the wiper blade arm/mechanism before being fed back through the Wagging Tail. You'll need adjacent holes for each attachment point with the space between adjacent holes matching the width of the wiper arm at that point. Using the pointy end of one blade of a pair of scissors carefully puncture holes in the Wagging Tail for the cable ties to be threaded through. The cable ties run through the puncture holes in the Wagging Tail from the front, then loop around the wiper arm before returning via the adjacent hole. 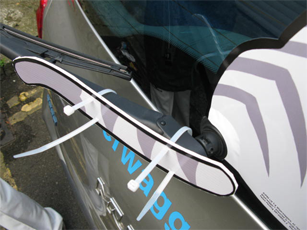 Once threaded through and back, the tape end of the cable tie is inserted into the locking head of the cable tie and pulled tight until the Wagging Tail is held firmly in place on the wiper arm. Surplus cable tie can be removed using scissors. Once both cable ties have been fitted please perform one final check to ensure the Wagging Tail is secure. 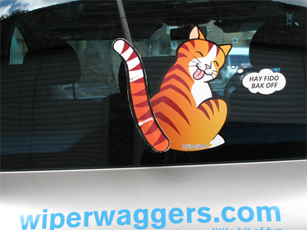 Choose a Cat Thought from the four Thought Bubbles provided to apply to your WiperWagger® image. Select a position for the Thought Bubble to be applied leaving room for the two mini bubbles in between the cats head and the Thought Bubble. Peel off the protective covering from each of the mini bubbles in turn and apply them to the car rear windscreen. Then peel off the protective covering for the Thought Bubble and stick that down on the rear windscreen. When you finally decide that you have to say goodbye to your Wagging Tail Cat then you'll find it's easy to remove. 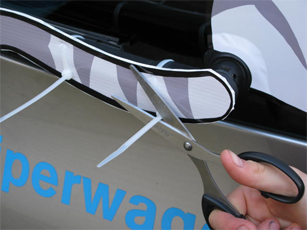 If you used the curved Wagging Tail you should cut through the cable ties securing it to the wiper arm using scissors and remove. For all the other decals you should pick at the edges with a finger nail until you can lift up a corner and then peel the remainder of the decal from the rear windscreen/bodywork. Removing the decals should not leave any marks on your vehicle.